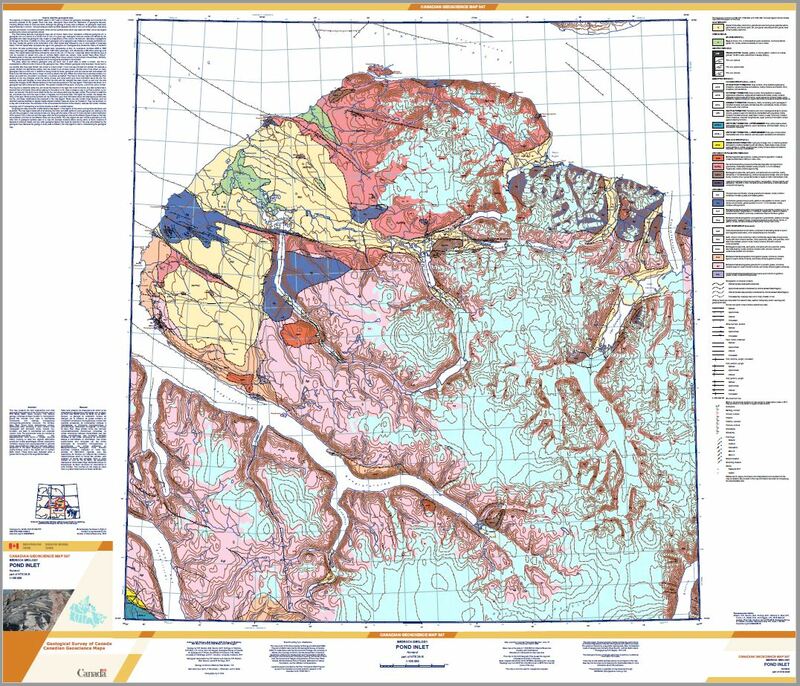 This map presents the field observations and initial geological interpretations for the Pond Inlet area (part of NTS 38-B), Baffin Island, Nunavut. The bedrock geology comprises Archean tonalitic to monzogranitic gneiss that includes minor mafic to intermediate components, and relatively homogeneous monzogranite-granodiorite intrusions. The Archean Mary River Group forms discontinuous volcano-sedimentary belts, consisting of mafic volcanic rocks interlayered with siliciclastic strata, banded iron-formation, and felsic to intermediate and ultramafic volcanic units. The supracrustal rocks are intruded by monzogranite-granodiorite plutons. Pre-Mesoproterozoic rocks record a complex structural history involving at least two regional deformation events and mineral assemblages indicate metamorphic conditions ranging from upper-greenschist to granulite facies. Mesoproterozoic clastic and carbonate platform sequences of the Bylot Supergroup unconformably overlie Archean units in the central part of northern Baffin Island. These strata were deposited within a graben that forms part of the larger Borden Basin. This map represents one of three bedrock geology maps resulting from six weeks of geological mapping conducted in the Pond Inlet - Mary River area of northern Baffin Island during July-August 2017. This mapping forms part of the Geo-Mapping for Energy and Minerals (GEM-2) North Baffin Bedrock Mapping Project led by the Geological Survey of Canada. The study area is mainly comprised of approx. 2.9-2.7 billion years old granite-type rocks and approx. 2.7 billion years old volcanic and sedimentary rocks of the Mary River Group. This group of rocks hosts iron ore deposits, including the high-grade, large-tonnage Mary River deposit. The study area also contains younger (approx. 1.27-1.24 billion years old) sedimentary rocks that mostly consist of sandstone, shale and limestone, known as the Bylot Supergroup. The new mapping presented here provides an improved understanding of the geology of northern Baffin Island, with implications for economic mineral potential and the ancient assembly of tectonic plates in the eastern Canadian Arctic.